Finally, I see where all the fall colors come from. So often each tree changes to its one color, then the leaves drop and become the brown, crunchy mass. This past week, I’ve seen trees in all shades, from blazing orange to fiery red to brilliant gold. Yesterday I even saw one of the most beautiful fall maples with shades from green to yellow and red to orange. If I hadn’t been driving, I think I would have stopped to bask in its brilliance. I ground myself in my writing. To write, I must be still so as to receive the truth that is being channeled through me. I have to be careful about my influences, for everything in my environment affects how I interpret any given moment. When writing, I feel my closest connection to the Divine and feel that this is my right livelihood. Going forward, I make a conscious effort to write more daily, be a productive writer and establish myself as such. I craft to disperse the creative energy in a physical, practical way. Perhaps if I channeled all my creative energy into writing, I wouldn’t need to write more, but I enjoy greatly using my goods, giving handmade gifts and teaching the children how to make thin Now I will increase my skills with what I have and make what I need or need to give. I would like to make a few things well to sell in an Etsy shop. That would be nice. My relationships with others I feel has always been golden. I do my best to be authentic with them, to listen well and to be participatory. With my children and husband, I have to make a conscious effort to love myself well so that I may love them wholly. We are currently seeking a family counselor so as to address our needs, for raising kids is harder than we ever imagined it could be. We need some help, and asking for help is completely okay. It’s better to ask for help than to sink into despair, withdrawing from yourself and others. May we be always honest, loving and respectful of ourselves and each other. In the daily round, I am pleased with where my expectations are. I’ve come a long way in understanding what I can and cannot do, steering myself away from the buckets of shoulds. That’s not to say I don’t occasionally regress. In a given day, like all mothers, I combine all my different roles. I am at once a writer, wife, mother, spiritual seeker and birth advocate and educator/doula. I’m sure that’s probably not even all aspects of my being, but they affect most of what I do, day in and day out. As with the leaves, I am constantly changing. Where I am today differs from yesterday and tomorrow, but if I can hear what I need from and for my soul, then I can visualize it and try my best to make it manifest. To do so, I need some quiet, some time for me. Thanks, Casey, for giving me that time yesterday when I needed it so badly. Thanks, Kaye, for listening. I am a woman like many others, waking each day to live into whom she is called to be. 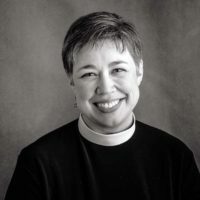 Childhood dreams of becoming a mother, writer, and teacher came together in the reality of following the path to the priesthood in The Episcopal Church. A passion for listening, watching, and loving deeply has sharpened my ability to see the extraordinary in moments, to see through the chaos -- wonderful and overwhelming as it may be -- to find the grace at the heart of the matter.